Elsyca designed the cathodic protection system for world’s first self-installing concrete gravity based wind turbine foundation structure. 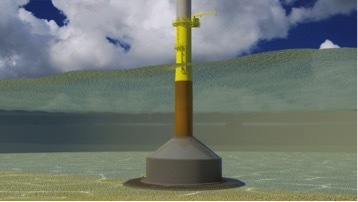 Royal BAM Group has been awarded a contract by EDF Energy Renewables via SPV Blyth Offshore Demonstrator Ltd, to design, fabricate and install five full-size gravity base foundations for wind turbines of 41.5MW capacity. The prototype foundation structures are pre-fabricated on-shore, then towed to the Blyth deployment site where they are filled with sand/water mixture for lowering them onto a pre-installed gravel bed. Prediction of the long term efficiency of the corrosion protection system is essential because any survey of the monopile inside the concrete caisson is impossible. A correct design of the CP system and the installation of monitoring devices is crucial for securing the integrity of the monopile during 26 years service life. A sacrificial anode system was designed for both internal and external corrosion protection purposes. Elsyca’s advanced CPMaster simulation platform and our in-house expertise was used for the in-depth analysis of the long-term cathodic protection effectiveness. A first design was made based on DNV OS J-101 and DNV RP B 401 requirements and further refined for the complexity of the foundation structure. Our time-dependent modeling approach allowed simulating the evolution of the CP efficiency in the sand filled compartments.